I bet the last thing your child wants to do when going back to school is writing (or more homework as they’ll say)! 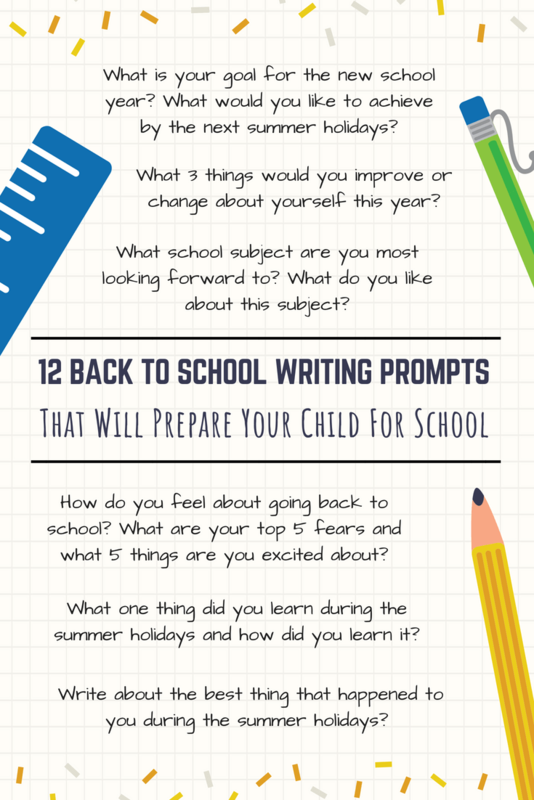 Not to worry we have come up with 12 back to school writing prompts that will help your child settle in and take away those first day fears. We all know how the first day of school daunting for most kids, that’s why it is important to slowly prepare your kids into the back to school routine. One way to support your child is encourage them to write down their feelings in a journal or notebook. Getting your child to think about school before actually going will help to prepare for any challenges or fears they might have. We have specially created these writing prompts to not only prepare your child for going back to school, but also to help them with their writing skills. How do you feel about going back to school? What are your top 5 fears and what 5 things are you excited about? Write about the best thing that happened to you during the summer holidays? You can talk about this with your friends when you go back to school. What was the worst part of your summer holidays? What one thing did you learn during the summer holidays and how did you learn it? What school subject are you most looking forward to? What do you like about this subject? Do you want to make new friends in the new school term? How would you go about making friends? List a few points to help you or someone else? What is your goal for the new school year? What would you like to achieve by the next summer holidays? How would you better organise your time this school year, so you can complete all your assignments on time and have time to do things you enjoy? Do you want to join any after-school or lunchtime clubs this year? Which clubs would you like to join or would you create your own? What 3 things would you improve or change about yourself this year? What 3 things would you keep the same about yourself and will carry on doing this year? Which part of the school year are you most looking forward to? Any tips for helping your child with going back to school? What back to school routines do you have for helping your child when comes to their first day back? Let us know your ideas and thoughts in the comments below. If your child is particularly anxious about going back to school, take a look at these 12 hilarious back to school picture books.